Edited 1 time(s). Last edit at 04/16/2018 07:37PM by VladCronos. Use the M305 command in the config.g file to specify the thermistor parameters. If you know the Steinhart-Hart model coefficients for your thermistor, then specify the resistance at 25C (T parameter), the reciprocal of the S-H b coefficient (B parameter), and the S-H c coefficient (C parameter). If you don't known the S-H coefficients, pick 3 points from the resistance vs. temperature table for your thermistor (e.g. 25C, 180C and 280C) and use the calculator in the configuration tool at reprapfirmware.org to calculate them. You can limit the maximum heater PWM using the S parameter in the M307 command. More help is available in the Duet and RepRapFirmware forum at duet3d.com. Edited 1 time(s). Last edit at 04/17/2018 02:26AM by dc42. Thanks a lot. Going to try this. I only have B parameter and Temperature points values. And it keeps reporting 50C at room temperature and about 30C off at high temps. Try the RepRapFirmware configurator at reprapfirmware.org. On the Heaters page, click on the link to calculate thermistor coefficients. You can enter three resistance/temperature pairs there. Okay, calculator is not helping at all. It is 500C thermistor and I think reprap calc thinks I entered the wrong value, while I didn't. See screenshot attached. Edited 1 time(s). Last edit at 04/17/2018 05:45AM by VladCronos. Try this calculator instead [www.thinksrs.com]. The B parameter in M305 is the reciprocal of the B value from that calculator. BTW, what brand is it ? Are you a full time employee or is it part of your curriculum ? How about giving the chart, curve here ? A 500C thermistor could interest people here. Edited 1 time(s). Last edit at 04/18/2018 11:53AM by MKSA. 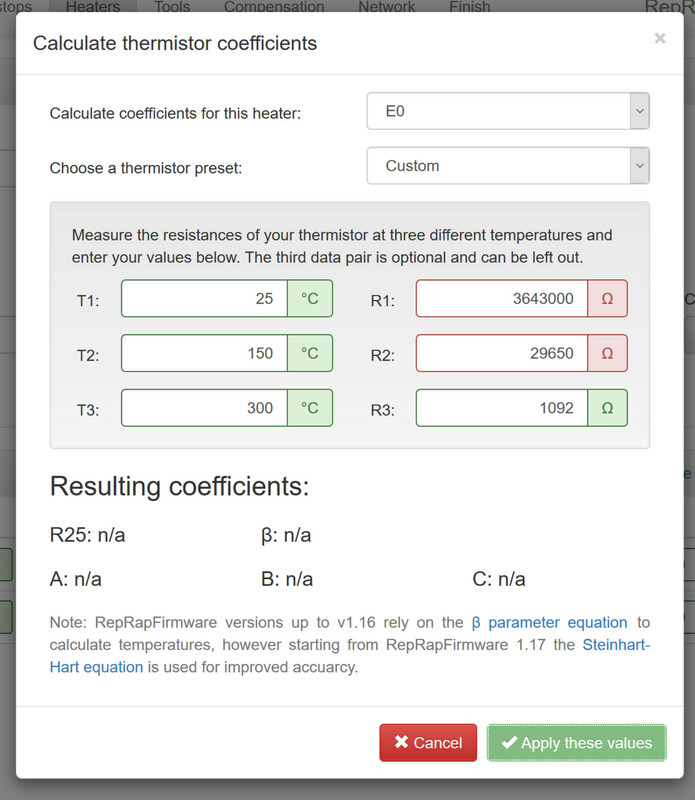 The calculator at reprapfirmware.org has now been updated to allow thermistor resistance up to 10Mohms.